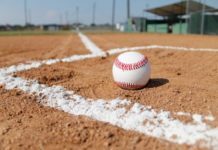 The University of Nebraska at Omaha’s softball team has gotten off to a rocky start on the year, losing four out of five games in the Ramada-UNI Dome Classic in Cedar Falls, Iowa on Feb. 10-12. UNO’s determination and motivation this year is fueled by both returning seniors, as well as talented underclassmen. Sophomore Laura Rocker noted on UNO’s softball media day that they have their eyes set at finishing at the top of their League. “Our goal this year is to be number one in the Summit [League],” Roecker said. 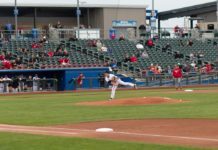 The squad’s opening game win against Montana emitted signs of a promising season, as they took down the Grizzlies 7-4 for the first win of the season. Freshman infielders Emily Klosterman and Hailey Bartz high-lighted the offense, with both go-ing 2-for-3 at the dish including a double for each of them. Right-hander Laura Roecker picked up her first win of the season, and senior Abbie Clanton earned her first save of the season. Senior outfielder Lizzie Noble mentioned on softball media day how big of an impact these underclassmen are already making. “Seeing the freshman come in and the underclassman too, it’s been truly amazing to see the growth between the players,” Noble said. The first game, unfortunately, was the highlight of the weekend. The squad had a rough two days after their win and could not capitalize on their momentum. 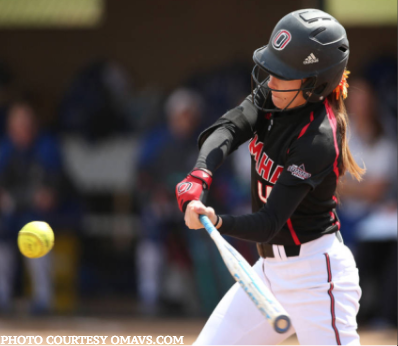 On an early 8 a.m. game, UNO fell short to Drake in a 5-4 battle despite redshirt freshman Vicky Kinney go-ing 3-for-3 at the plate with two home runs. It appeared that the first loss of the season drained the Mavericks momentum, as they were shut out 8-0 in six innings against Wisconsin. Seniors Lia Mancuso and Nicole Warren were the only Mavericks to tally a hit against the Badgers. The team was out-hit 9-to-2, and the Badgers had a three-run third and sixth inning to solidify their win. On Sunday, a day that could’ve served as a reset button for the squad, the Mavs dug themselves into a deeper losing hole than the previous day. 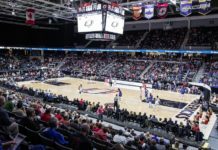 Instead of finishing out strong in their final double-header of the weekend, UNO dropped two more losses to Toledo and Northern Iowa. The Toledo game was the worst of the weekend, as the Mavs surren-dered a 17-5 loss. Despite the offensive effort from Mancuso, who finished 3-for-4 and added three stolen bases, starting pitcher Roecker gave up eight runs and ten hits in just two innings, and the Mavs never came back to take the lead. A recurring pattern of losing momentum flashed back in their final game of the weekend, as the UNI Panthers shut out the Mavericks 4-0. Mancuso again led the offense with two hits, including a double. Despite the solid performance on the mound from Roecker, who tossed six innings and allowed four runs on just four hits, UNO’s bats could not get anything going and the Mavs tacked on their fourth loss of the year. The Mavericks recently finished up another tournament this past weekend in Stanford, California, where they faced Stanford and UC Santa Barbara twice in the Stanford Nike Invitational. Their next games will be played in Atlanta, Georgia where they will have a doubleheader against Georgia Tech Friday. The team will stay in Atlanta and face Georgia State in another doubleheader Saturday. Regardless of the slow start to the season, these girls will keep their heads up and continue to compete in each game. On softball media day, senior infielder Nicole Warren gave a warning to future opponents for the entirety of the season.